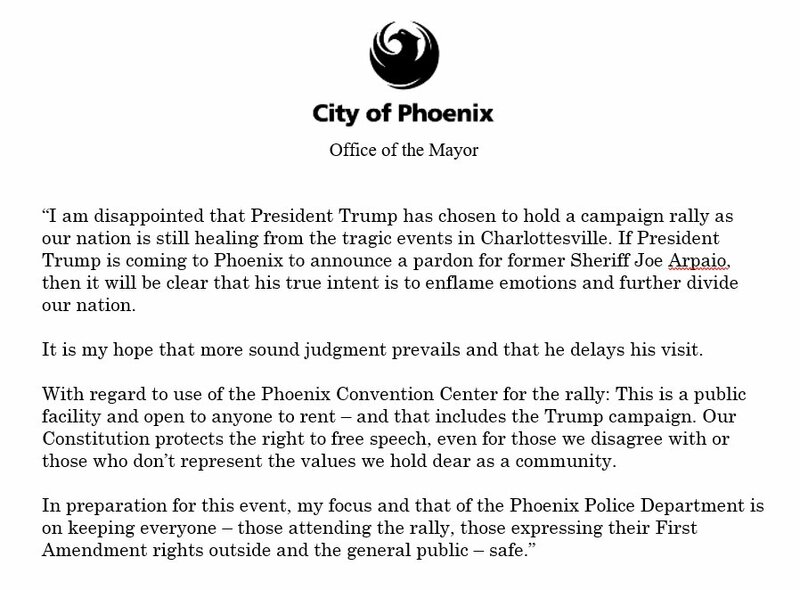 The Hill wrote: The mayor of Phoenix, Ariz., issued a statement Wednesday night urging President Trump to delay his campaign-style rally in the city while "our nation is still healing" from the violence that took place in Charlottesville, Va., over the weekend. Everybody is closing gates and slamming doors shut to avoid Trump like the plague. Who could blame them? And after the right royal mess he made of the Charlottesville saga, he tried to smooth things over in his usual sophisticated, statesman-like way .... yep via a tweet on social media - alongside teenagers discussing their latest romantic crush. It took 3 deletions of his tweets to finally spell ''heal'' properly! The secret services have already run out of money for Trump's protection. Having used up an entire year's funds already. The astronomical cost of protecting him and his huge extended family and inlaws. And keeping him safe during his frequent visits to mara lago and his new jersey golf course. And the crippling the cost of protecting the enormous Trump tower itself even when empty Plus all the trips the adult kids kept making abroad to pursue their own personal business interests. Incredibly the secret services have spent more in protecting him and his clan in his 7/8 months as POTUS than during Obama's entire 8 years as POTUS. The same Obama whom Trump harassed so regularly over the amount the SS were spending on protecting Obama's tiny family. This is beyond ironic, it is surreal!!! He is fast turning into Donny no mates, apart from the like minded nutters he seems to be surrounding himself with now. Happily his state visit to the UK is 'put on hold' too......loosely translated that means we don't want him here either.